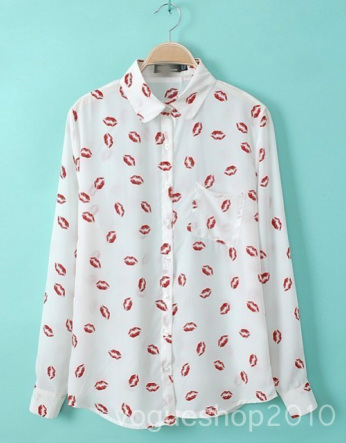 This week's Item of the Week is this kiss print button-down blouse! I call it the RiRi Woo Blouse because of the Red Lipstick that Rihanna has for MAC that sold out in 3 hours! It is the perfect piece for a look that's cute, comfortable, and it draws attention your way. I love this shirt because of the lipstick prints and because although it's long sleeved, it's chiffon so it's breathable. You can wear this shirt so many ways and match it with so many different colors. You can dress it down to make it look more chill or dress it up to make it look more chic! Make everyone turn heads and buy your RiRi Woo blouse NOW!